Chocolate Orange Luxury Shaving Soap has everything you're looking for in a quality shaving soap. Stable, rich lather, a nice slip and a good post shave feel. Chocolate Orange Luxury tallow shave soap has everything you're looking for in a quality artisan shaving soap. This soap has rich lather that is stable, nice slip and conditioning ingredients for your skin. Ginger’s Garden shaving soaps are specifically formulated for wet shavers for a nice smooth shave. Chocolate Orange shaving soap is suited for both men and women. 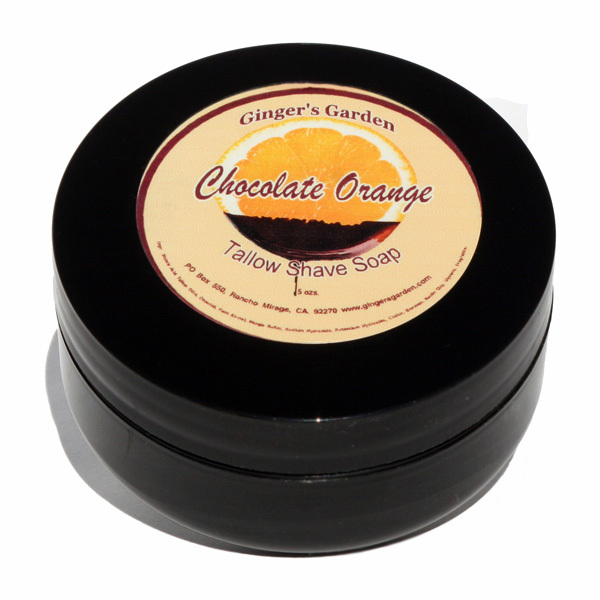 Take your wet shaving experience to a new level with Ginger’s Garden Tallow Chocolate Orange shaving soap. Give that special someone in your life like a father, husband, son, boyfriend, brother or that significant other the gift of Ginger’s Garden Shave Soap, Aftershave, Balm or a cologne spray. Wet shaving is a truly superior and enjoyable experience. You deserve a great shave. Ginger’s Garden shaving soaps are made by hand in Palm Springs, California. They are cured for 4-6 weeks to make sure that the soap is mild. Chocolate Orange Shaving Soap comes in a reusable jar and can be used in either hard or soft water. Waterproof label keeps the jar looking fresh. Lather either straight in the jar, or put a small amount into your shaving bowl or scuttle to whip up lots of lather with your shaving brush. This is a Limited Edition Seasonal product. Ingredients: Stearic Acid, Tallow, Olive, Coconut, Palm Kernel, Mango Butter, Sodium Hydroxide, Potassium Hydroxide, Castor, Beeswax, Fragrance.